Welcome to the JSHmoviestuff REVIEW OF 2013. Me too, George. Mr. Clooney’s line said in his inimitable way in GRAVITY, made me think it’s been quite a year for stories in 2013. So before we head too much into the new year, it’s time to look over the last 12 months and at the outstanding films I’ve chosen for the JSHmoviestuff REVIEW OF 2013. I’ve realised that the films that really moved me have been a mix of expertly re-told true-life events and brilliantly fictional tales. We’ve seen what an obsession does to someone, whether they’re hunting the world’s most wanted man or think they’re in possession of a winning lottery ticket; we’ve witnessed an exhilarating recreation of a real-life crime and seen how after several versions, a superhero can come up fresh and newly-minted; and we’ve also been truly wowed (and terrified) by what it’s like to see the Earth from several thousand miles up or in the eye of a storm on the open ocean. The year kicked off in imposing style with ZERO DARK THIRTY, Kathryn Bigelow’s superlative movie charting the decade-long hunt to capture the world’s most wanted terrorist. Anchored by an amazing performance from Jessica Chastain, who I’d wanted to take the ‘Best Actress’ trophy at the Oscars (she missed out to a deserving Jennifer Lawrence for Silver Linings Playbook) but who nevertheless still walked away with a number of awards for what was a flawless piece of acting. Bigelow surrounded her though with the kind of ensemble that made you count the seconds till they appeared on screen – Jason Clarke, Mark Strong, Kyle Chandler, Edgar Ramirez, Chris Pratt, Joel Edgerton and of course, the late and very great James Gandolfini – they were all present and correct in making this a truly riveting experience. If there was a film to earn the title of ‘movie of the year 2013’ then this was probably it. It took a couple of months for my next choice to appear but when it did IRON MAN THREE earned the title of the biggest surprise of the year. What a terrific event this was, with Shane Black drafted in (on star Robert Downey Jr’s suggestion) as the new director of the series, taking over duties from Jon Favreau. And gosh, what an impression he made with Tony Stark aka Iron Man, a character who’s endeared himself to us over Iron Man 1 and 2 and then most memorably for me as a totally wonderful element of The Avengers but let’s face it, who would have thought with the third solo movie we could have possibly seen something so fresh, vibrant and exhilaratingly original? But it was. With the gorgeous Gwyneth Paltrow giving quite the sassiest performance yet as assistant Pepper Potts, along with the returning Don Cheadle who this time really made Colonel Rhodes a stand-out character, how could this instalment have been any better? Well, with the inclusion of Rebecca Hall as the brainy Maya, Guy Pearce as the charismatic but shadowy Killian, the brilliant James Badge Dale in another of his brilliant performances that I’ve admired from him this year (along with Flight, World War Z, The Lone Ranger and Parkland) as the more than slightly volatile Savin and let’s not forget a truly extraordinary Ben Kingsley as formidable foe The Mandarin. Top drawer stuff. Tom Hanks is one of my favourite actors and the news that he and director Paul Greengrass had collaborated on a real-life story had me eagerly anticipating the release of my next film CAPTAIN PHILLIPS and I wasn’t disappointed. It was a stunning recreation of the events in 2009 when a group of Somali pirates, led by newcomer Barkhad Abdi’s incredible portrayal of leader Muse, took over the container ship Maersk Alabama and held its captain Richard Phillips hostage. Greengrass cleverly charted the two very different men’s very different journeys towards their fateful meeting and then built up the tension of the subsequent crisis to white-knuckle levels. This was a breathtaking voyage with what I hope is Tom Hanks third Oscar-winning performance. Wow. Just wow. That’s what I thought of GRAVITY. I saw the mind-blowing new movie from director Alfonso Cuaron a week after Captain Phillips and felt, with the absolutely stunning performance from Sandra Bullock at its centre, I was watching the next ‘Best Actress’ Oscar recipient. Cuaron’s previous film, the dystopian tale Children of Men was released in 2006 and I think he’s pretty much been working on Gravity since then. But it was all worth it because the images he put on screen, along with the awe-inspiring special effects made you feel as though you were in that capsule alongside Bullock’s rookie engineer and George Clooney‘s seasoned astronaut, watching in horror as their spacecraft was torn apart by debris and wondering how they were ever going to make it back to Earth. It was one hell of a ride. I heard about my next film NEBRASKA back in May at the Cannes film festival (where it earned Bruce Dern the ‘Best Actor’ prize) and of course because it was a new piece of work from one of my favourites writer/directors working today, Alexander Payne, I thought it sounded like an unmissable treat. I wasn’t wrong. Catching the movie on its UK release just before Christmas, I found it to be one of the most heartfelt moments in the cinema over the last 12 months. The funny and at times, melancholy road trip undertaken by the curmudgeonly old Woody (Dern) and his younger son David (Will Forte, delivering a great dramatic performance after his tenure on Saturday Night Live) from Montana to Nebraska, all in the hope of collecting the million dollar sweepstakes money that Woody is convinced he’s won, was all beautifully evoked in Phedon Papamichael’s monochrome photography. In a career that’s already given us a number of memorable movies, this was a real high point for Payne. My last choice is ALL IS LOST which just made 2013 deadline, as I caught it a couple of days after its release on Boxing Day and as with Nebraska, I’d had it earmarked since Cannes as a must-see. Again, it didn’t let me down. J. 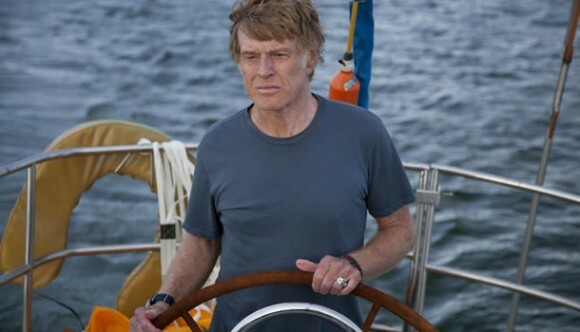 C Chandor’s second film, after his terrific debut Margin Call, gave us an astonishing Robert Redford on bravura form in an almost existential drama on the high seas. An almost silent occupant of a small boat – known only to us as Our Man – alone on the open ocean who, after an accident to his craft has to use all his ingenuity and will to battle the ever more dangerous elements was totally thrilling viewing and for me, marks Chandor alongside Bennett Miller as a film-maker whose work you cannot miss. Finally, a few movies that didn’t quite make it but that I really enjoyed: Man of Steel, Zack Snyder’s wonderful new version of the Superman story was a film that some people just didn’t take to but I thought was really fab; Star Trek Into Darkness was J.J. Abrams terrific follow-up to his phenomenal 2009 reboot, that had a more emotional, even more epic feel than its predecessor and a stellar bad guy in the shape of Benedict Cumberbatch. Being fascinated by all things Kennedy-related, I thought Peter Landesmann’s Parkland was absorbing; The Hunger Games: Catching Fire was a brilliantly realised sequel, containing another exemplary performance from Jennifer Lawrence; and The Place Beyond the Pines featured a mesmerising one from Ryan Gosling in its opening hour, which along with Tom Hanks’ performance in Captain Phillips was my favourite acting of the year. There isn’t, unfortunately, a foreign language film included my review of the year, as I didn’t see anything to equal last year’s magnificent Rust and Bone but I do hope to catch Ashgar Farhadi’s award-winning The Past when it finally gets a UK release and I’ve heard so many great things about Joshua Oppenheimer’s documentary The Act of Killing, that I also need to add that to my 2014 must-see list. So there you have it. Another year is done and dusted. There’s already a mouth-watering collection of films opening in the first few months of 2014 that I have my eye on already and so see you at the movies!